Jakarta governor in tears inside courtroom as protestors chant outside. 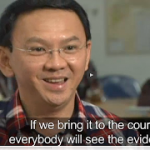 VICTORIA, Australia (Morning Star News) – The blasphemy trial of Jakarta Gov. Basuki “Ahok” Tjahaja Purnama began this morning, with the ethnic Chinese Christian breaking into tears inside the courtroom while hundreds of people protested outside. A panel of judges will hear from 30 witnesses and see 50 pieces of evidence regarding the charge of defaming the Koran. The trial, which is being televised live, is being rushed through the court and is expected to conclude early in 2017. Reporting from Jakarta, Australian Broadcasting Corporation (ABC) correspondent Adam Harvey noted that Ahok looked deeply anxious as he entered the courtroom. “He can see the writing on the wall,” Harvey opined. Ahok broke down in tears twice as he testified. Insisting that he would never intentionally insult the Koran or hurt Muslims, he spoke of his deep affection for his Muslim godparents, and he recalled how he helped poor Indonesians to perform the Hajj pilgrimage when he was a district chief a decade ago. “As a person who grew up among Muslims, it is not possible for me to intentionally insult Islam because that is the same as disrespecting the people I appreciate and love,” Ahok reportedly said. Once the clear frontrunner in the gubernatorial race, recent opinion polls indicate that Ahok has now slipped to second place behind Agus Yudhoyono, the son of former president Susilo Bambang Yudhoyono. 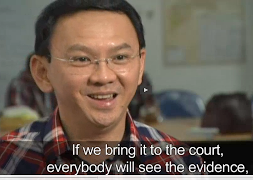 The gubernatorial race may be the last thing on Ahok’s mind now. If found guilty, which most analysts believe he will be, Ahok faces up to five years in prison. Analysts believe his career, his liberty – and possibly even his life – are at stake. Using crude, racist and provocative terms, Muslim cleric Habib Muhsin Alathas referred to Ahok as a “son of Satan” and re-asserted the koranic/Islamic principle that Christians should never have authority over Muslims at a rally over the weekend, according to an Australian Broadcasting Corporation (ABC) report. Likewise, professor Tim Lindsay of Melbourne Law School said he expects Ahok will be convicted. Not only has a fatwa been issued against him, but the massive rallies have terrified authorities, he reportedly said. Consequently, Lindsay expects judges to be influenced by public opinion and pay little attention to evidence. Video footage of the speech went viral on YouTube, and Islamic extremists claimed Ahok had blasphemed against the Koran and Islamic clerics. Ahok on Oct. 10 apologized “to all Muslims and anyone who felt offended,” saying it was not his intention to slight Islam or the Koran. The court has been adjourned until Dec. 20.